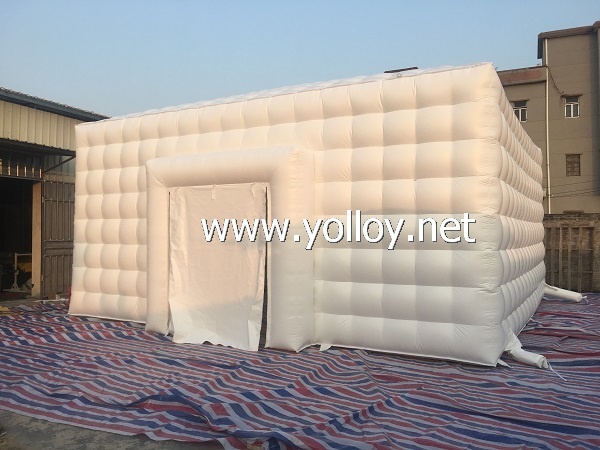 For the Inflatable Marquee Inflatable Cube Tent,we made it in commercial grade PVC tarpaulin which is high Durability, UV-Resistance, Fire resistant, waterproof and NO Lead.And we make it according to CE&EN71. We double stitch everywhere and fourfold stitch at the bottom point place. We use strong zipper and there is a zipper cover outside the zipper for protection. And we make flap outside the air tube, the flap can slow down air out when power cut off suddenly.What't more we also make many fasten rings for fix. 1, Competitive Price: offer high quality products best worthy price. 3, Satisfied After-Sale Service: Our inflatable can be used more than 3 years .If it is damaged,you can use the glue and material to repair it. 4, Satisfied Customer Experience: Customer experience is what we value very much. Your advice will bring you not only our truly appreciation but also “Surprise Discount”! 5, Fast Delivery: We will try our best to assit you delivery the goods as soon as we can. 6, Customer Made & OEM available.